Borobudur and Prambanan is no doubt the biggest and the most popular landmarks in Yogyakarta. Many visitors visit the temples every single day and it’s no secret that the location is always packed. For you who need more hidden alternative for Yogyakarta’s temple, Sambisari Temple can be one of the best options. Sambisari Temple can be considered as the lost ruin at first since it was buried under the earth until a farmer discovered the carved stone of this temple in 1966. Experts concluded that the temple was once buried by the rock and sand which are delivered by Mount Merapi’s eruption during 1906. After the discovery, the temple got reconstructed and restored and the process was finished in 1987. The temple now stands around 6.5 meters below the ground that makes it a unique temple that is located in Yogyakarta. The temple is located in Purwomartani Village, which is one of the villages in Kalasan Sub-district, Sleman, Yogygkarta. If you are traveling from the downtown of Yogyakarta, it will only take about 30 minutes drive out from the downtown. One of the things that makes this temple interesting and worth checking for is that it is located underground. It creates a unique character compared to the other popular temples located in Yogyakarta. Plus, here are several other highlights that make it worth a peek. Compared to Borobudur and Prambanan which are known as the most famous Yogyakarta temples, Sambisari Temple is for sure less crowded. That’s why for you who want to get relaxed while enjoying the cultural site of Yogyakarta, this temple is surely the best place to go. Sambisari Temple is surrounded by greenery view that can bless your eyes. It can be the best place to get relaxed from the hustle bustle of the city. However, you may need to consider bringing an umbrella with you because it can be hot at noon. It’s not so crowded and it has that greenery view that will bless your eyes. So, what else’s that we should expect from this temple? Of course, the highlight of every temple tour is to explore the epic architecture of the temple. And Sambisari has that one too! There are a few ways that you can take into account when it comes to go to the Sambisari temple. You can consider taking a sharing car or sharing tour to visit the temple. Here, you can expect for an English-speaker driver, a car to drive you to the temple and a hotel transfer. On the other hand, you can also consider taking public transport. However, it is not really recommended especially for a first-time traveler. Now, you have known more about the Sambisari Temple. 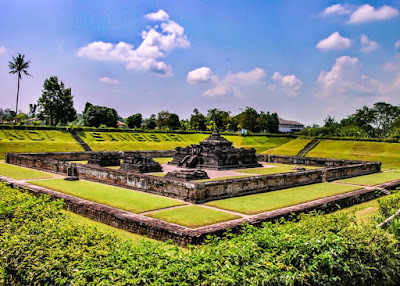 If you are interested to take a tour to Sambisari temple or more famous temples like Borobudur and Prambanan, you can visit www.jogjabromotour.com and find the best tour package deal in Yogyakarta.